I put Albania into the same post as Macedonia and Kosovo, seeing as they feel that the whole area was once a greater Albanian empire. While both Kosovo and Macedonia were formerly part of Yugoslavia, Albania was not. In fact, they felt that Tito’s communism was way too liberal, and they built over 300,000 bunkers throughout the country, preparing for the invasion from Yugoslavia or Russia. The invasion never came. Albania is a bit rough around the edges- not the best tourist experience we’ve ever had (but not the worst). Our bus arriving to the capitol was four hours later than the bus company said it would be, and our bus leaving was an hour and a half late. Getting through the border took two hours both times. But our busses wound their way through coastal towns and lake regions that looked pleasant, and the capital city, Tirana, is nice enough, slowly recovering from its communism-era building style. National Opera of Albania- Communism style architecture but it reminds me of the Kennedy Center in DC! Albania shares a massive lake with Montenegro, and shares another on its border with Macedonia. We went out to Lake Ohrid for a couple of days and stayed at a small town just 10 km over the Macedonian border. Ohrid, a UNESCO site and “the jewel in Macedonia’s crown”, once had 365 churches in it, but fewer remain now. In the 1980s they discovered underground the remains of a Greek amphitheater dating back to 200 BC, and the lake is renowned for freshwater pearls. 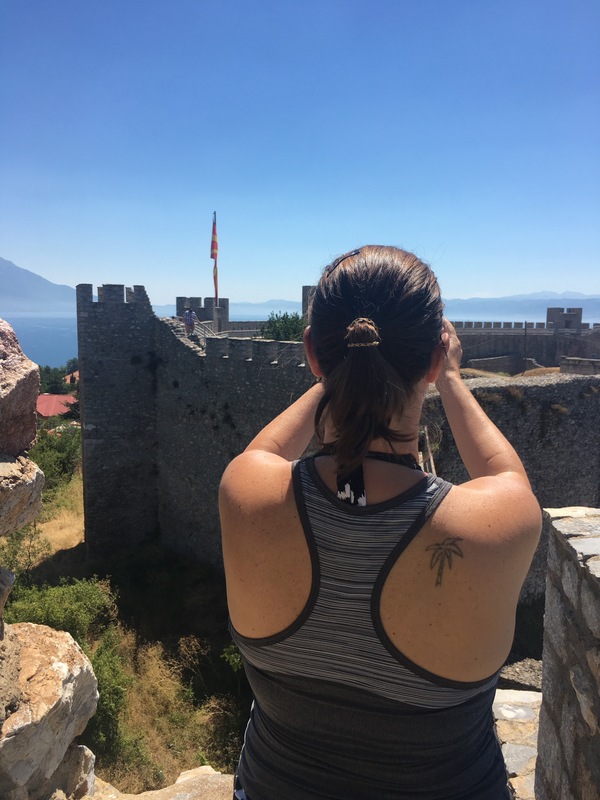 We had some swims in the lake and explored the town a bit, walking up to the fortress and the amphitheater (we unfortunately missed the Summer Festival performance of King Lear by just one night). The place does not have a free walking tour, but happily I was able to find a self-guided walk on my GPSMyCity app, so we used that. The bus to Skopje, the capital of Macedonia, left exactly on time, and three and a half hours later we were in the city. Skopje itself is decked out in a sort of New Old Greek style- kind of like Las Vegas- with lots of statues, marble, and columns. They claim Philip II and Alexander the Great for themselves, which makes the Macedonian province of Greece kind of mad, and resulted in the long-winded formal name of Macedonia, “Former Yugoslavian Republic of Macedonia” (FYROM) and a veto by Greece keeping them out of the EU. About 25% of Macedonians are ethnically Albanian, and the black double headed eagle on a field of red- Emperor Constantine’s symbol- can be seen often in flags and t-shirts and alongside Macedonia’s red-and-yellow sunbeams flag. 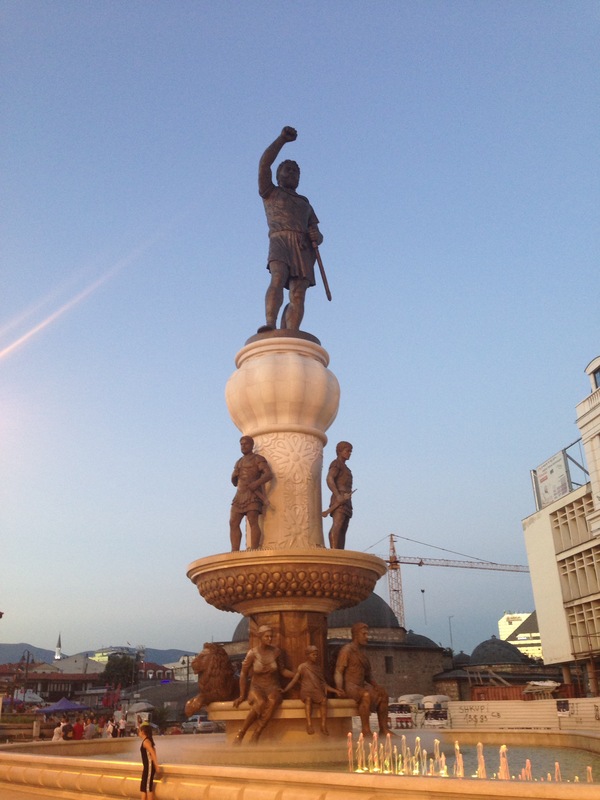 Skopje is a pretty ancient city, inhabited and ruled by Paeonians, Persians, Greeks, Gauls, Romans, Byzantines, Ottomans, Bulgarians, Yugoslavians, and now Macedonians. Their Archaeological Museum is actually a very thorough collection of the ages, worth visiting. 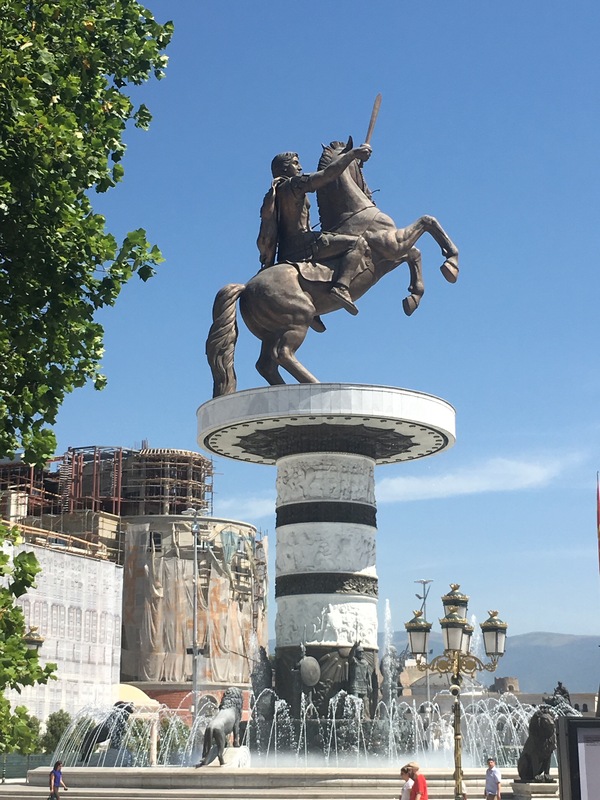 Roman Emperor Justinian, who was born near Skopje, helped rebuild the city after a 519 CE earthquake, while the Ottomans rebuilt in 1550, and Tito rebuilt after a 1963 earthquake. Most Macedonians are Orthodox Christian, but a sizable minority are Muslim, and their most famous recent resident, Mother Theresa (born in Macedonia but ethnically Albanian) was Roman Catholic. From Skopje, several busses a day head to Kosovo- to most of the world an independent country, but to Serbia, a province. The Serbians refuse to let Kosovo go, on the grounds that several monasteries in Kosovo are the birthplace of Serbian Orthodox Church, to which Kosovo does not exactly disagree, but points out that Kosovo is 92% ethnically Albanian and wants nothing to do with Serbia. They love NATO, Bill Clinton, and Tony Blair for helping them to get Serbia out of Kosovo in the late 1990s. Kosovo, and its capital Pristina, are definitely still developing and have quite a ways to go. Sights around Pristina can be done in one day, and if you had private transportation, you could probably do most of Kosovo’s other main attractions in one day as well. We visited the Museum of Kosovo, where my favorite piece was a mural of Mother Theresa made entirely out of staples; the Ethnographic Museum of Kosovo, which was really just one small 18th c Ottoman-style home that was occupied until 1956; and the National Library, which might be the oddest and most interesting example of Brutalism architecture I’ve ever seen.